can i bring child of alara back when Karmic Guide came from graveyard? 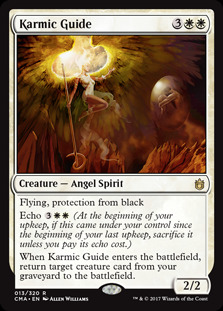 When Karmic Guide enters the battlefield, return target creature card from your graveyard to the battlefield. Also I just wanted to thank you all for helping me build this! I can say proudly say that this deck has made me so many fun memories playing against Control. This is not a fully optimized list. 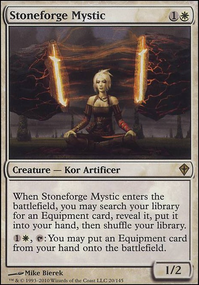 It lacks a lot of fast mana, and generally has a lot of 'do-nothing' cards: the monuments, Oketra's Monument , and Bontu's Monument ; Field of Souls ; etc. That said, the deck is very interactive and incredibly strong when games go long. 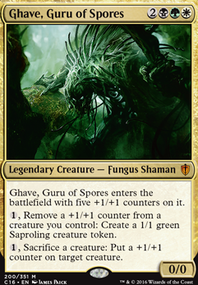 Because the mana curve is relatively low, we are able to recur Gutterbones , Relentless Dead , etc. 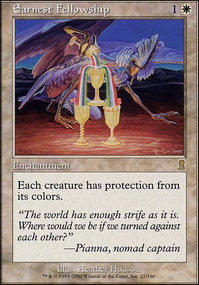 for card draw while still interacting with our opponents and assembling a win condition. The altars: Phyrexian Altar and Ashnod's Altar are game winning threats that go infinite in combination with Teysa, Orzhov Scion and one of our recur-able threats. A free sac outlet, and Karmic Guide + Reveillark + Gray Merchant of Asphodel goes for infinite drain. There are many other loops that can be made with our aristocrats...too many to list. I would encourage anyone adapting this list to play test a lot and familiarize yourself with the deck before taking it out for a spin with your play group. Our protective equipment Swiftfoot Boots , Lightning Greaves , and Whispersilk Cloak are in the deck to protect Krav and/or Regna to preserve their ability to generate value. Because they are so expensive, if they are removed, it really sets the deck back, so be careful about when you deploy them--especially Krav. Here is my deck that I have been playing in paper that I have been trying to find an alternate hulk pile for. Have you considered Fiend Hunter ? It goes inf with Sun Titan and Karmic Guide . It can be used to permanently exile a creature as long as you have a sac outlet. You can use it to protect a creature you want to keep on the board before you wrath. You can use it to get a second etb trigger off any of your creatures. 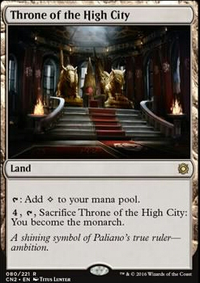 You could also even be heckin lame and use it as was intended and just exile an opponents creature temporarily. It is an amazing piece in my Karador deck. What up man, anything new to report? I just wanted to give an update. So after playing maybe a total of 20 games without the following cards: Hellkite Tyrant and Grim Tutor . I can say the deck is averaging T5 wins. Sometimes T3,T4 and T6 but generally, the average is T5. Gamble Surprisingly, has been working in my favor with tutoring, each time. This has been the most played tutor out of the bunch. Combat Celebrant has been put inplace of Hellkite Tyrant but I still havent been able to abuse Combat Celebrant yet. I was going to add in Hatred in its place but at least for me, during my gameplays I wouldn't have enough life to knock someone out with it. 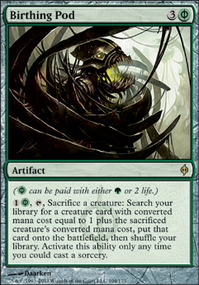 Plus I feel its similar to Master of Cruelties + Kaalia of the Vast combo. So now my thoughts are adding another win con. Is it a good idea? I dont know but since I haven't filled the gap of Hellkite Tyrant , it leads me to explore some options. It's just an idea, a suggestion, another way to win but I don't know. What are your thought's about it, like I said, just trying to come up with other ideas. Hell, in the end I might just throw in Hellkite Tyrant and be done. Who knows. Thanks a lot for your kind words and freaking 12 upvotes VietMoneys, i'm flattered! a.) Mono- doesn't come with a lot of free sac outlets - if you have any others, i'd be more than happy to hear about them (if they qualify considering b.). Currently i'm considering Altar of Dementia , due to the fact it can fill my gy and double as top deck-tutor disruption. b.) My playgroup frowns upon infinites (i'm cool with that) and both Ashnod's Altar and Phyrexian Altar combo waaay too easily. With this type of deck it's more or less impossible to avoid all combos (e.g. more than 1 -artifact + etb/die recursion/bounce option + free sac outlet + a value engine, say Cathars' Crusade ) but i try to avoid them enough not to look like bending our house rules on purpose. Karmic Guide + Reveillark are similarily problematic as described under b.) when combined with a free sac outlet. Plus, they don't qualify to be recurred with Teshar, Ancestor's Apostle . The only exception to said parameter right now is Elesh Norn, Grand Cenobite because she's a great non-infinite win con. I'd like to keep it that way. Sun Titan is a nuts card, yet in this deck he's easily outclassed by the 10-ish recursing/bounce effects due to the simple fact i'm not blinking, i'm recasting things. For a total of i can usually recurr twice. 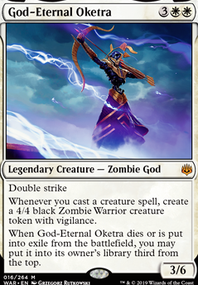 Plus, he can't be reanimated by my commander. You'd be surprised how well this deck actually works without its commander, because of the extreme redundancy of engines. Typically i start flooding the board until the setup is right to drop my commander. Significantly later than i planned when brewing the deck. Anyhow, thanks again for the input, i'd be more than happy to hear about your feedback on my other decks. I'll have a go at yours, for sure.